Zara’s on a bit of a shrimp kick right now. Which is kind of cool as she wasn’t into any type of fish about 6 months ago, so I’m hoping in the next 6 months we can convince her mussels are where it’s at. My mom had come down the other day and brought some shrimp with her that she cooked up with olive oil, salt and pepper, and I popped it in the freezer for a day that I wanted an easy start to a meal. Fast forward to a dinner last week, when Zara had been relatively hyper all day, no nap (her phasing these out has just really thrown me through a loop) and I had been sort of loopy myself all day. (I’ll blame it on not having coffee) Time to plan a very simple, very quick dinner. I defrosted the shrimp in the fridge by taking them out of the freezer and popping into the fridge that morning. By dinnertime they were ready to throw in a pan. It was about 1 lb of peeled, de-veined medium-sized shrimp. I then found myself giving into my need to have Mexican food. I felt I had no choice. Shrimp Tacos it was. Being that, like the last post, I had not gone to the grocery store, we were a bit low in the food department. I used what I had in the fridge, and found I was pretty lucky that my friend Brie had brought over a vinegar based slaw salad the night before that we had leftover. Yes. Toppings. These tacos are super simple to make, I always make a deconstructed taco for Z because she likes to make her own on the fly. To prepare the shrimp. In a medium saute pan, heat shrimp with olive oil and season with a couple of turns of each salt and pepper. Cook, stirring lightly and not often until shrimp turn a brilliant pink color. Remove from pan and reserve. To make your slaw. Add your cabbage mix to a large bowl. Stir in vinegar and olive oil with salad tongs or a spoon. This is to ensure that you coat as much of the cabbage/carrot mix as possible. Add sunflower seeds and apples. Toss. To build your tacos. Have your child grate the cheese (I mean really. I hate grating cheese. While she is at the age where she thinks this is the best thing ever, I say have at it girl. I’m sure you will come to a time you hate doing it. A la Mommy.) Toast your tortillas. I do this the semi-dangerous way, the way my mom taught me. Turn one of your stovetop burners on low (or medium-low if you are brave). Place tortilla on stove top and toast until the side starts to bubble just a bit. Flip and do the other side. Repeat until all tortillas are toasted (We did 2 each). Next add your shrimp. I felt 4 shrimp per taco was the perfect amount. Just line them up and voila! Add your cheese next so it melts right onto your shrimp (due to the warmth of the shrimp and tortilla). 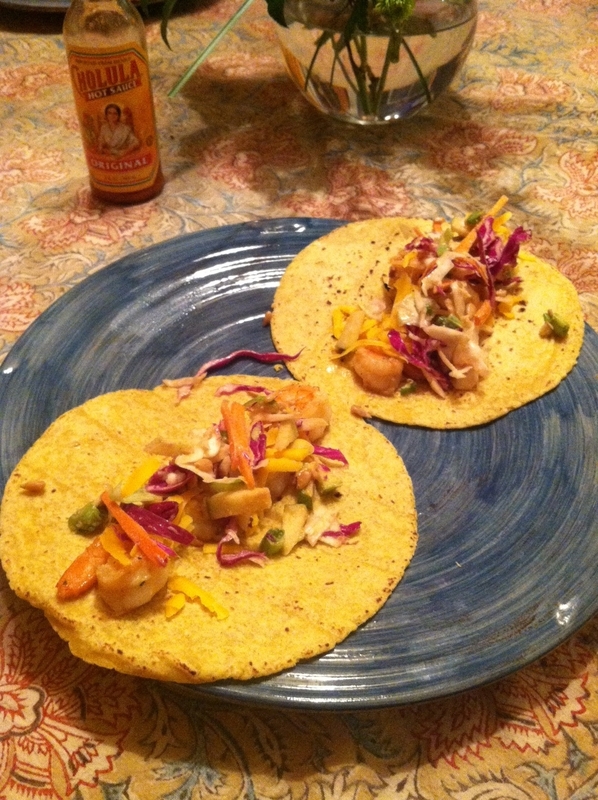 Add slaw and then if you so desire (and I always do) dump as much Cholula on as you can handle.